I’m really not a germaphobe, but something happens to me when I cut and cook raw chicken. My husband says I become obsessive: I refuse to touch the sink handle without a paper towel in my hand, and I don’t want to grab a paper towel and touch the top of the dispenser without washing my hands first — but I can’t do that without holding the bottle of soap with chicken-laden hands. You get the picture. It’s not pretty. Lucky for me, touch-free devices can help get me through my somewhat obsessive behavior, from the garbage pail to the kitchen sink. 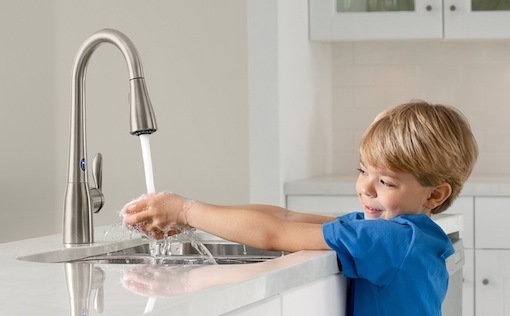 Moen’s MotionSense faucets let me wash my hands without ever touching the faucet or handle. Thanks to advanced motion sensors, I can wave my drippy chicken hands to start the water flowing at a preset temperature. Four styles of Moen kitchen faucets are available with MotionSense technology. Moen provided a review sample of the Brantford faucet for me to try. It looks just like a regular kitchen faucet, only it requires a little more installation work under the sink, as well as a battery pack that holds six AAA batteries. Moen says the batteries should last for about a year, and an LED light lets you know when it’s time to change. Once the faucet is installed, which an experienced DIYer can do in less than two hours, the Wave Sensor lets you simply wave your hand above the faucet to turn the water on or off. Not only does this stop the spread of germs, but it’s a convenient way to fill large pots with water. Set the pot in the sink while it fills; when it’s full, just wave your hand to turn the water off. Lest you worry you’ll accidentally wave your hand over the faucet before walking away for the day, an auto shutoff mode stops the water after it’s been running for two minutes. The other way to activate the flow of water is the Ready Sensor, which is located on the front of the faucet near the base. Just like moving your hands in front of a sink sensor in a restaurant bathroom, holding your hand, cup or pot under the faucet tells the sensor to turn on. Take away your hand or pot, and the water turns off again. This is particularly useful when your hands are dirty from cooking dinner. Of course you can use the handle to adjust water flow and temperature as you would ordinarily, and like many other faucets, there’s a pull-down spray spout for rinsing the sink. Wash the faucet as you would any other polished surface; in fact, there's a guest/cleaning mode that turns off the sensors when you have company or are cleaning the sink. Moen isn’t the only company to make hands-free faucets, but it offers the largest selection of attractive kitchen faucets. On average, adding MotionSense to the price of a faucet adds from $150 to $200 to the cost. MotionSense faucets are available in chrome, oil-rubbed bronze and spot-resist stainless finishes, which Moen says resists water spots and fingerprints. 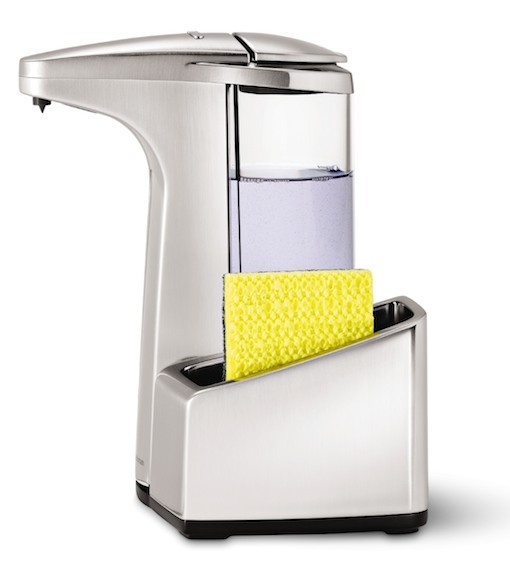 Simplehuman calls its products "tools for efficient living," and I can think of nothing more efficient than holding a sponge or my hand under a dispenser for a preset amount of soap without having to touch the dispenser or shake a tube of gel. While there are other automated soap dispensers on the market, this one includes a brushed nickel, removable caddy for the dish sponge so it stays put rather than getting buried under a pile of dirty dishes at the bottom of the sink. I particularly like the “volume control” that lets me set how much liquid I want dispensed, so I won’t get a huge glob when all I really want is a little dab. The sensor (powered by four AA batteries) on the front easily senses my sponge, my hand or even a utensil, and since the sponge is stored on the side, I don’t get accidental drips on my hand. The sensor can be turned off for cleaning, and the caddy comes off for easy cleaning. Whether you use an under-cabinet paper towel dispenser or prefer something that stands on your counter, sometimes you need to grab a paper towel with one hand. A quick scan of Amazon brings up dozens of different types of touch-free dispensers, ranging from $50 to $150 for a battery-operated device, but I settled on the $25 Simplehuman Tension Arm Paper Towel Holder. It looks quite similar to the countertop stainless steel dispenser I currently use, but the variable tension arm on the side holds the towels in place so I can easily tear off one sheet at a time without ever touching the top of the stand. Even better, I no longer have to unscrew the finial to remove the old roll and replace it with a new one. 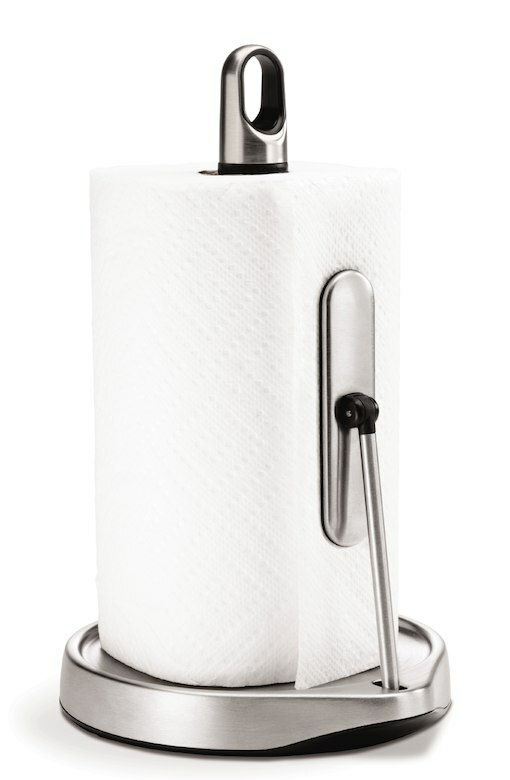 The stainless steel base is weighted so that it stands its ground as you pull your towel. There’s a finger loop for picking up the dispenser and moving it around. If you prefer the under-cabinet style and aren’t limited by budget, the Clean Cut Touchless Paper Towel Dispenser is great high-tech option. It uses LED Breaking Beam technology so you control how much towel you want, and cuts it to any length even if you’re using a pre-perforated brand. The longer you hold your hand up to break the beam, the longer the length you’ll get. When you remove your hand, you activate the cutter and the towel is dispensed for you—all without you having to touch anything. The company says installation should take about 15 minutes and since it requires an AC adapter for power, you will need to mount it somewhat close to an outlet. 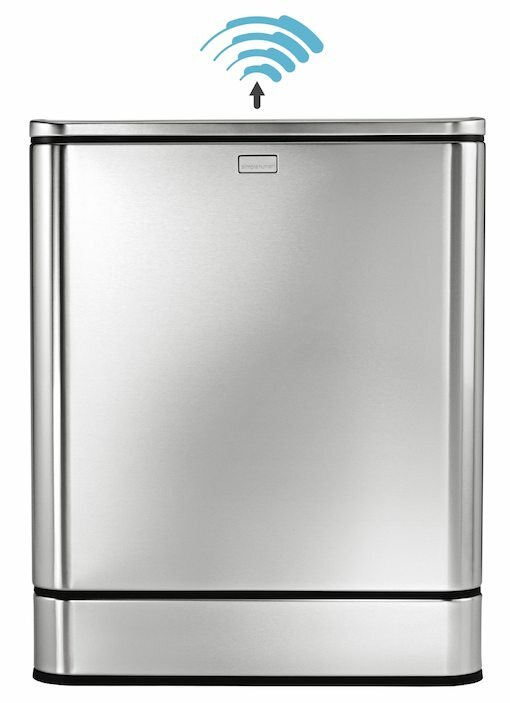 Since most of my kitchen appliances are stainless steel, my effort to find the right touch-free garbage pail led me right back to Simplehuman. Its 55-liter Sensor Can is exactly the right size for my kitchen, with a huge capacity, and it opens automatically with just a wave of my hand. Since I placed my sample in a high-traffic area of the kitchen, I worried that it would open every time someone walked by. It turns out this can is pretty smart and, for the most part, can detect the difference between a hand that's passing by and a hand that's waving. The trigger zone is right above the lid, so you won't get many accidental opens, though if your hand swings directly over it as you walk by, the lid will open. Once the lid is open, the trigger zone can sense when your hands are nearby; scraping a plate or peeling a carrot will keep it from closing before you’re done. A “stay-open” mode lets you choose to keep the lid open for a longer period of time. The only downside to this can is the sound it makes when it opens and closes; it kinds of whooshes as it opens and make a wubba-wubba sound as it closes. That could definitely be quieter. The can runs on six C batteries, which are estimated to last a year (there’s an optional $30 power adapter), and an integrated charcoal filter in the lid absorbs odors. I like the design and the rectangular shape of this garbage can; it fits up against the wall and takes up less space than a round can, and the fingerprint-proof stainless steel outside is a nice touch, so to speak. The inner can comes out for easy cleaning, and you can use trash bags to line it. While we’re talking about hands-free kitchen conveniences, if you don’t have a robotic vacuum, it may be time to consider getting one for their convenience and smart scheduling. There are a few different brands on the market that roam your house in search of dust bunnies and pet hair; some work better than others on carpets and getting past fringe. I primarily use a bot vac for my kitchen floor and the hardwood floors on the first floor of my home. 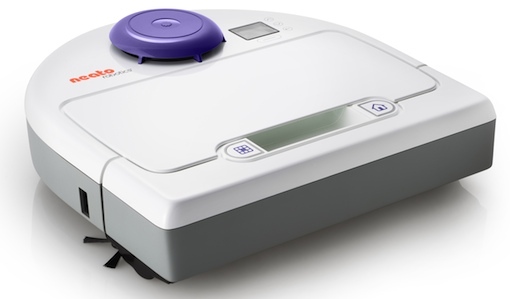 The Neato Robotics BotVac does a great job of picking up the dirt and crumbs I would ordinarily have to sweep up and then collect with a dust pan or vacuum. That’s because it has powerful suction capabilities, like an ordinary vacuum. Other robotic vacuums use a sweeping technology, making them better suited for thicker carpets. Neato uses a Technology-Laser-guided navigation system that first scans and then maps the room. That way, the unit is armed with a plan of attack for maneuvering around kitchen stools and the center island. If it runs out of battery power while cleaning, the BotVac returns to its base for recharging and then goes back to where it left off to complete the job. I can set a schedule for when I want it to run — say, once I’ve gone upstairs for the night — and know that in the morning, the kitchen floor will be clean and the BotVac will be back where it belongs. For big messes, I can always push a button to turn it on and start the job immediately. The BotVac series varies in price depending on which types of brushes, blades and filter options you prefer. There’s one designed specifically for picking up pet hair that CNET gave a four-star rating, choosing it over the Roomba. “In almost every situation we threw at it, the Neato picked up more debris than the competition, often in significantly less time," CNET reported. "It's an efficient, powerful little machine, and its laser-guided navigation system is one of the smartest you'll find in any robot vacuum.” CNET also noted "The BotVac also did much better on the pet hair test, making it ultimately more recommendable that iRobot's Roomba 870." Sure, I can use a vacuum like the portable Dyson, but for the same price, I get a vacuum that runs when I want it to whether I’m there or not, and I don’t have to touch it — except, of course, to empty the dust bin. If you're looking for more kitchen gadgets, check out our kitchen picks for healthy living and the future of kitchen tech.